I had an epiphany this weekend: One of my beloved childhood treats, wäie or wähe, was a perfect candidate for a free-sugar, gluten-free makeover. The Swiss tart has a flaky pastry crust that is filled with an eggy custard and savory (cheese, spinach and onions) or sweets ingredients (seasonal fruit). Traditionally, you have the first then the latter. It is usually made in a sheet-cake pan, tart pan or pie pan. But by American standards the sweet version is not actually all that sweet. An entire pie only includes 3 T. of sugar to begin with. I’ve seen people in Starbucks put more sugar in their venti coffee. I just replaced it with honey in my version. My only real challenge was finding something to use instead of the pastry crust. Since ground hazel nuts are often sprinkled in the bottom of the sweet version before pouring in the fruit and custard, I used them along with oats and butter to make a crust. Use either a pie crust or, if you are feeling indulgent, puff pastry. Combined all ingredients in a bowl. Mix well. Press into an 8x11glass baking dish. For different forms you may need to adjust the amount. *can be replaced with plums, pitted cherries, etc. Preheat oven to 400F (200C). Filling the baking dish with the apples, arranging them so that they are flat on top. Make a design if you are feeling creative. 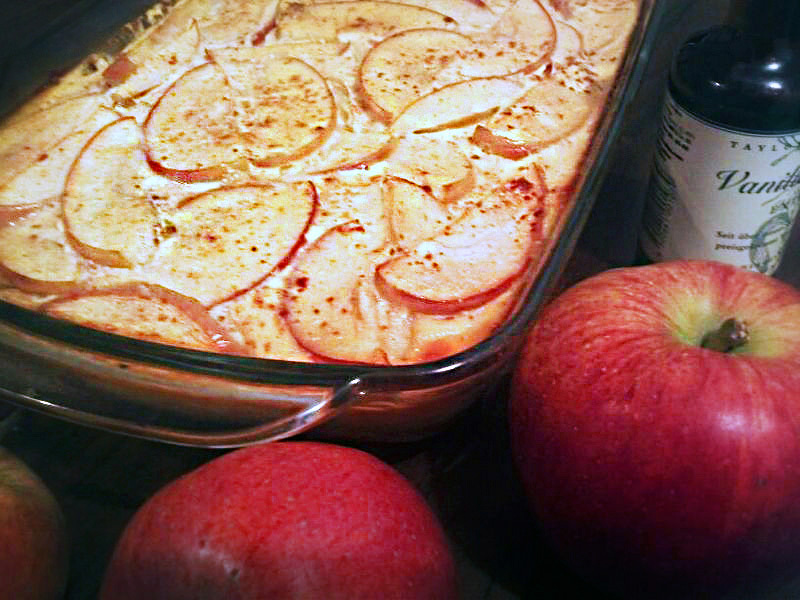 Bake for 7-10 minutes so the apples soften slightly. In a bowl, mix the sour cream , milk, honey, eggs, vanilla, cinnamon and salt until smooth. Some recipes replace the milk with apple juice. Pour mixture into the baking dish over the apples, sprinkle top with cinnamon and bake for an additional 20 minutes, or until the top begins to become golden around the edges.